Welcome to another Tarot Blog Hop! You may have hopped forward from Tarot Trends, or back from Pure Blessed Tarot, depending on which way round you like to go. Or maybe you found your way here from the Celtic Lenormand Facebook page, or somehow else. Whatever the case, I hope you'll make your way round the hop, there are sure to be plenty of interesting posts! And if you get lost along the way, here's the Master List. 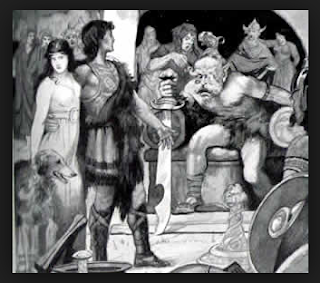 For this hop, our wrangler, Christiana Gaudet, invited us to look at myth as it connects to the cards. What I'd like to offer is a look at the card that I chose to represent this spoke on the Wheel of the Year in the Celtic Lenormand, and the myths that might be associated with it. In traditional decks, this card would be the Garden. 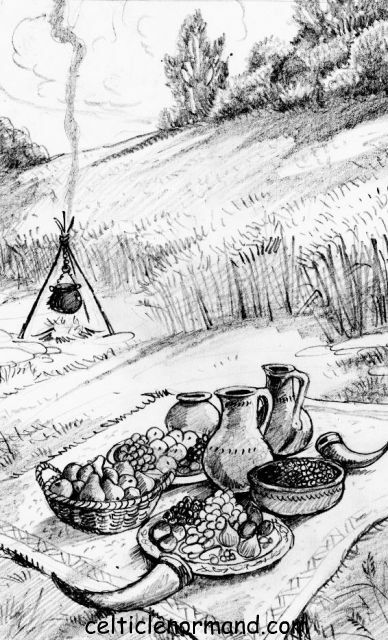 While there is much evidence of the Celts being involved in agriculture, there is little evidence of them having gardens. And those they did have were more of the kitchen-garden variety. Whereas the Lenormand garden was originally based on the Parisian (or generally city) practice of going for a walk or ride in the local gardens to see and be seen. It is connected with socialising, events, and hospitality, as well as our public persona. 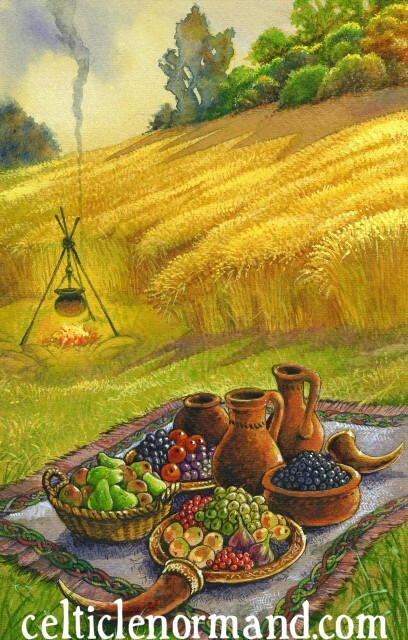 To represent that idea, I decided to rename the card Meadow, and show a space prepared for the gathering of a village or tribe to celebrate the Mabon harvest, focused more on fruits than on wheat, though that is present, too. Of course, one myth we see here is that of celebrating Mabon. There is plenty of discussion as to whether or not people in the past actually celebrated any or all of the 'pagan' festivals which are highlighted today. And strangely, the myths associated with Mabon refer to Beltaine as the time of his birth and to the Winter Solstice as the time of his rescue from imprisonment by King Arthur's knights. 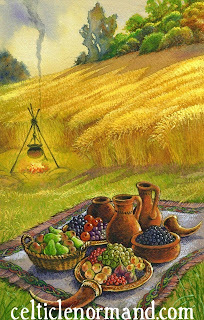 The naming of the second harvest for Mabon is probably a later pagan association, connecting with the idea of the cyclical battle between the Summer and Winter Gods. The young Son/God defeats the old to win a wife and continue the cycle of life, bringing fruitfulness to the earth. The time when Mabon is imprisoned could be associated with the harvest and the storing up of those fruits over the winter. Yet, even if Mabon is a name only later associated with the time of harvest, there is clear evidence of harvest festivals from the past. Though they may not have fallen on this exact date, the fact of giving thanks for the fruits of the season would have been a common occurrence. And gathering to celebrate that as a village or tribe would have been one of the times when groups came together, seeing friends old and new, telling tales of the trials of the year, and generally socialising and putting on a public face. So, though not exactly a Garden, the Meadow fits the spirit of the Lenormand card, and the spirit of this turn of the Wheel. Now, for more myths and cards, please hop on over to Pure Blessed Tarot. Another exquisite card! I'm another who is eagerly awaiting this deck. Lovely post - Happy Mabon! The colors in this one are so lovely. I'm really enjoying watching the birth of this deck. Well, given the hand you had in helping it become a reality, I'm happy you like the deck! Hi Joanna, I've heard that Mary Greer is going to have a six week webinar course for people to learn Lenormand, which would definitely be worth looking into! Lovely, Chloe! I am so glad you wrote about Mabon in this context - myth, seasonal change, pagan history and the birthing of a new deck. Fabulous! That's a beautiful card, Chloe - I'm now a convert to the colour images :-) Looking forward to seeing the finished deck. Ha, glad you're finally coming around to the colour images :) I love the warmth and breadth of Will's colour palette! Wonderful transformation making The Garden into The Meadow. What a great twist for this spoke of The Wheel. As I say, it felt more true to the spirit of the card that way, for that time :) So, not traditional, but hopefully still readable! Meadow is a beautiful name to give to the Garden and the illustration is gorgeous - of course! Deck is looking wonderful! Great card. Kudos to both you and Will for translating the Lenormand so well out of its accustomed time-space location. And thanks for the enlightenment on the actual history of the Mabon legend as well. An interesting blog post Chloë. The earliest meanings for the Park or Garden simply focus on association, with the cards around it describing to whom you’ll be introduced. The closer it was the querent’s card brings lasting friendships, and if it was far away, beware of false friendships. Basically communal mixing lol. Nice card. And thanks for the research. It's nice to know where things come from.